Employee privileges can be modified allowing you to decide what a given user can and cannot do in the app. 1.) Select Settings and then Employees from the top menu. 2.) Select the yellow Edit button next to the Employee you want to modify. 3.) Use the check boxes at the bottom of the pop up to define the user privileges. This gives employees a very limited set of permissions and will not display any pricing or costing information to users with that setting. 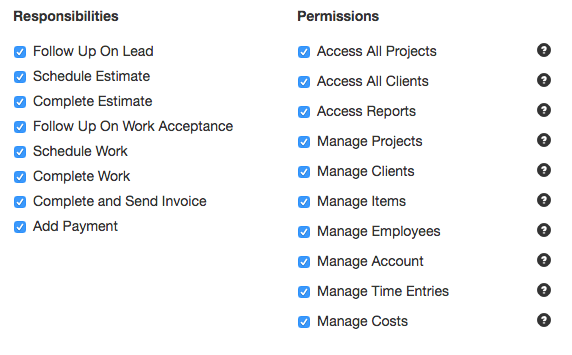 Employees with this setting can only see projects that are assigned to them.